Seattle… a big city that doesn’t feel like a big city! You can get a taste of the beautiful skylines, trendy coffee shops & lush greenery in a just short weekend getaway. My boyfriend, Joseph, & I had a free Southwest credit that had to be used up by October. When we finally sat down to decide on where to travel to.. Seattle was an easy yes for both of us! We visited Seattle at the start of fall when the cold breeze is flowing in and all of the leaves are beginning to change colors. Such a dreamy time especially because where we are from (Las Vegas), we don’t get much of a fall, ha! 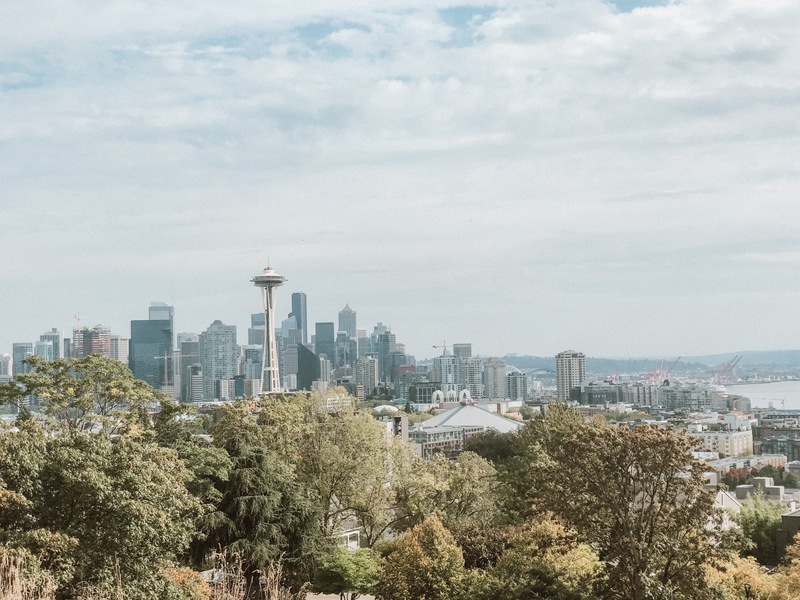 We hopped on a seriously early flight… which at the time seemed like the worst idea in the world but in hindsight, we got the most out of our first day in Seattle. We checked into our hotel, grabbed some much-needed coffee & headed over to Pikes Place Market! We started at the Gum Wall, which did not have nearly as much gum as we expected! Later that day we found out that the sugar from the gum is slowly eating away at the brick so they have to start scraping the gum off occasionally, such a bummer! If you ever hate your job, just remember that someone else’s job is scraping pounds of gum off a brick wall in Seattle, ha! The Gum wall is something that is so gross and so ridiculous (people lined up to stick their freshly chewed gum on a brick wall?? ), but yet… it’s one of those “you have to do it if you’re there” type of things. After going to the gum wall, head back up the stairs to the Pikes Place Market. I highly recommend going here on your first day so you can pick up some BEAUTIFUL bouquets for your room! I’ve never seen flowers like this in my life and they’re only $10!! We stopped for lunch at the famous “Pink Door” Italian restaurant – which did not disappoint! We ended the night watching the best sunset I’ve ever experienced at The Nest. You can either get a reservation to sit a booth right along the glass for $50/person or you can just walk in and stand at the bar. This rooftop bar has an unobstructed view of the Puget Sound, Pikes Place Market, Ferris Wheel and Bainbridge Island off in the distance. We started the day with.. you guessed it, coffee! Anchorhead Coffee is a must stop if you love coffee as much as I do! I was pretty hesitant to do the Space Needle because its ~$30 per person and sooo touristy, but I can honestly say I’m glad I did it. I’ve been to the top of the Empire State Building in New York City and was not impressed! You go up, take a few pictures and then come right back down. The Space Needle is not like that at all! They have two floors: The first is a glass bottom that revolves. Super freaky because you can see straight down 500+ft! The second has an indoor and outdoor section. The outdoor section has a glass wall with glass benches that you can sit on, which really gets the palms sweating, ha! The indoor section has a bar where you can enjoy a drink looking out at the beautiful views of the city & Puget Sound. Plus, for only $10 more, you can wander around the Chihuly glass garden and museum. Doesn’t take long to go all the way through, but the detail of these glass sculptures are sooo impressive! After our touristy fix, we headed over to Kerry Park to see the gorgeous views of the Seattle Skyline. If you’re a Grey’s Anatomy lover like myself, you can see Meredith Grey’s “intern” house just a block away! To see more Grey’s Anatomy film locations, check out my post: Grey’s Anatomy Lover’s Guide to Seattle. The neighborhood surrounding Kerry Park is so fun to wander around! The houses are all enormous with lush gardens out front, so you can pick yourself a pretty bouquet. Our nightcap included grabbing some food for a picnic at Gasworks Park to enjoy the sunset. We had some time to kill before sunset so we headed over to this oh-so-popular brewery called Fremont Brewing Company. Twinkly lights, board games, and picnic table-style seating was the perfect atmosphere for a beer flight! If you have a little extra time to spare, check out the Fremont Troll which is a short 5 minute walk down the road! We grabbed some Thai food and headed over to Gasworks park. The waterfront view of the Seattle skyline WOULD HAVE been the perfect spot for a sunset picnic….. However, being a Vegas gal and all – I was freezing and the overcast skies made the sunset non-existent. We left shortly after and headed back to the hotel bar for some wine. TIP: Plan a sunset picnic when there’s actually a sunset to watch, ha! Great idea but the darn weather was not on our side that evening! We started the morning off getting our second dose of coffee at Anchorhead Coffee and headed to the ferry terminal to check out Bainbridge Island. Ferries run every hour and the ferry to Bainbridge is about 35 minutes & only $8 per person for a round trip ride! The ferry ride alone is the highlight of the day because as you drift into Puget Sound, you get an amazing view of the entire Seattle Skyline. Before you know it you are coasting in to the foresty island of Bainbridge. Once you get off the ferry you can walk right to the main street: Winslow Way (5 min walk) with adorable store front shops, restaurants and wine bars. We only had a few hours here but I would’ve stayed all day! This downtown area was so darling and there were endless shops to explore. We had the yummiest pizza at Bruciato and ended with wine tastings at Eleven & Eagle Harbor. Don’t forget to get your pup a souvenir from the dog shop: The Barkery! If you have an extra day in Seattle, I would recommend venturing out of the city to see the greener side of Washington! There are hundreds of hikes to choose from. We went the last weekend of September and were sooo blessed with the weather! It was partly cloudy and low 70’s the entire time. Make reservations at the Pink Door Restaurant for dinner at least a week or two in advance! For only $25 extra you get an entire show with your dinner at this super yummy spot! This place books up SO fast so we could only go for lunch – still worth it though! Any pictures inside the Pink Door Restaurant?